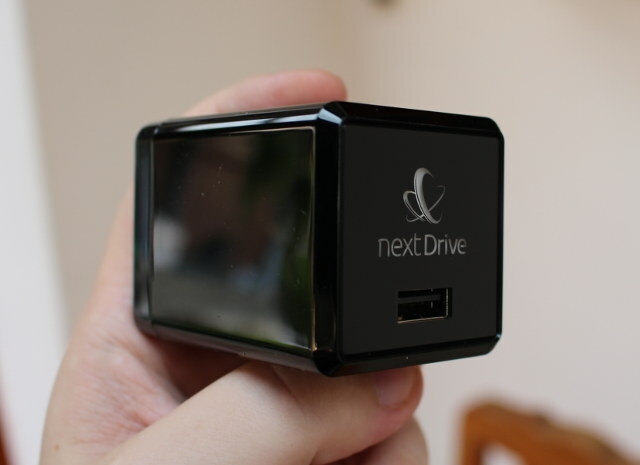 NextDrive Plug is an ARM based plug computer that’s used to store your photos or music, and/or as a security system using a webcam combined with Pixi motion sensor. They had a successful crowdfunding campaign, and now that they’ve sent rewards to backers, I’ve also received NextDrive Plug and Pixi for evaluation. The courier was not particularly gentle with the packages, but the devices themselves were not damaged. NextDrive Plus package included the box, a US plug, and a user’s manual in English. 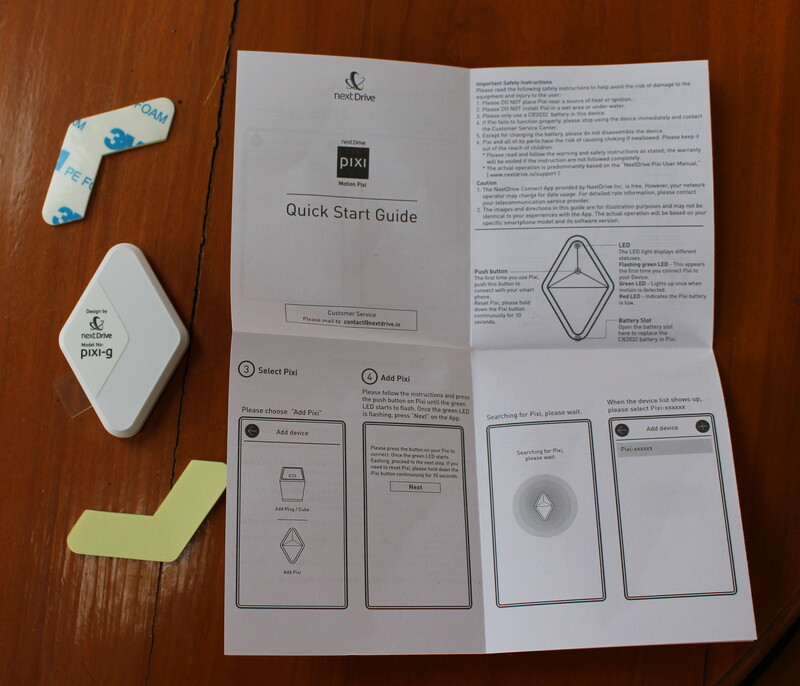 Pixi comes with two 3M stickers, and a user’s manual. 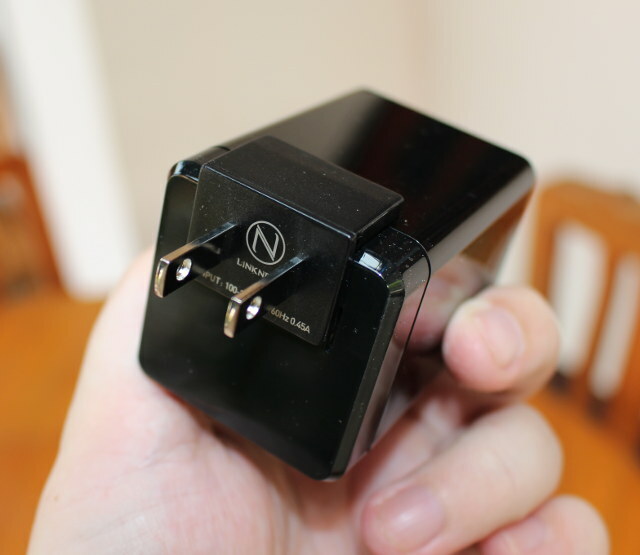 There’s also a plastic film to avoid depleting the battery, that you’ll need to remove before using the sensor. 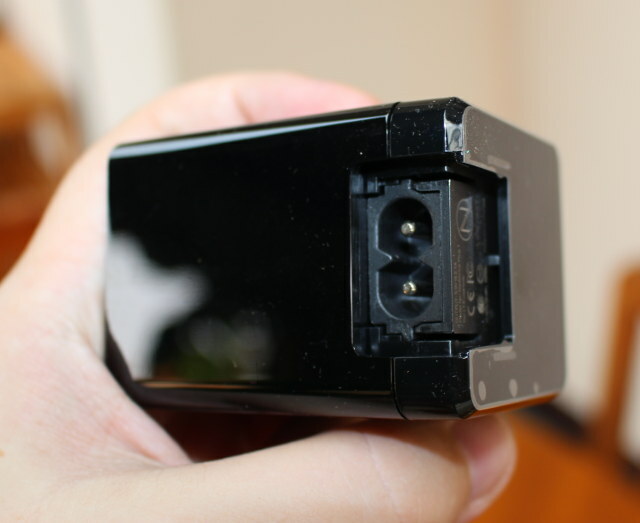 The interfaces on the plug are minimal with a USB port for a USB mass storage device (HDD, flash drive…) and/or a UVC webcam, and the socket for the power plug adapter on the back. You can then plug the adapter, mine was a US plug in that socket. 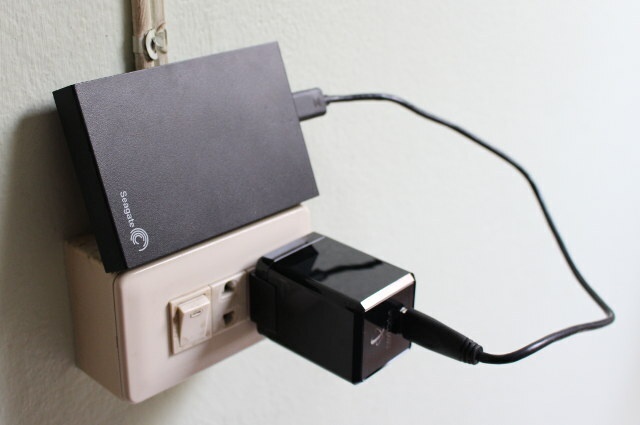 Now add a USB hard drive or stick, or a webcam, and connect it to the mains. 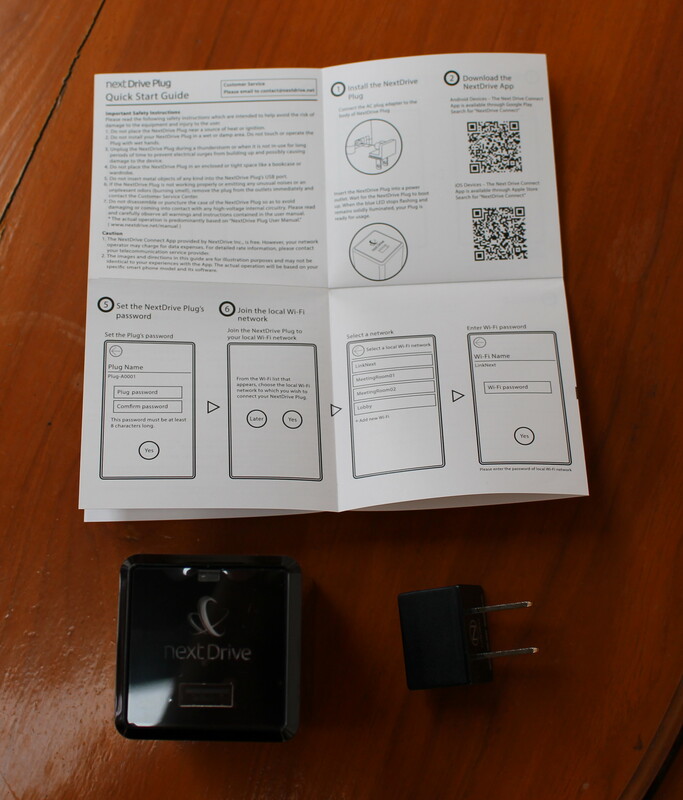 The plug is managed with a smartphone, and you’ll need to install NextDrive Connect app for Android or iOS. The first time you’ll need to add the Plug via Bluetooth LE. 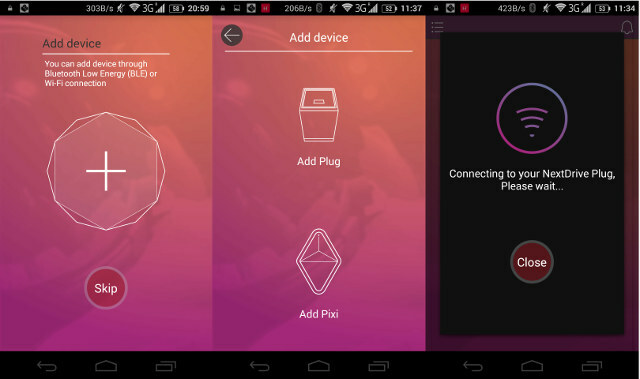 Then I’ve connected Pixi to my door, and added the Pixi to the app, right after a successful OTA firmware update. 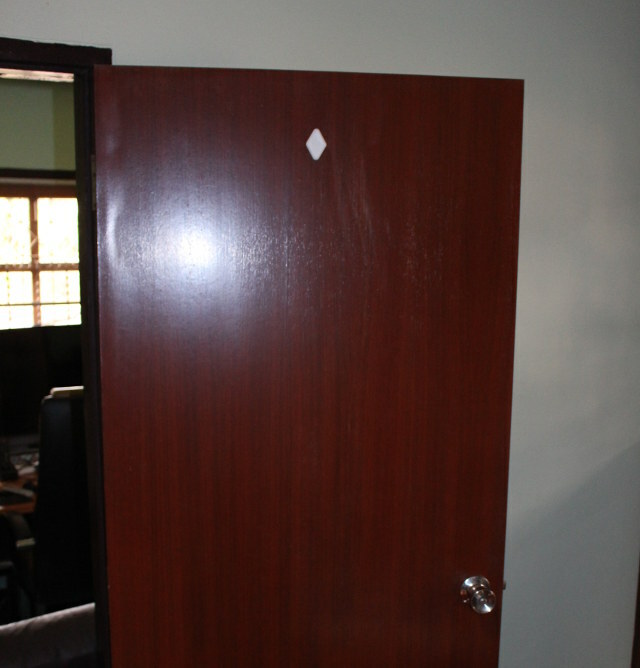 Then I tried Pixi motion sensor to see if I got notifications, and it worked well each time I would open or close the door. I also tried with my neighbor WiFi to make sure notifications could go beyond the local network, and no problem here. I connected a white brand UVC camera, but it was not recognized so I could not record videos triggered by the motion sensor. The list of known to work webcams is available here. I connected the hard drive back, and configured Photo backup. 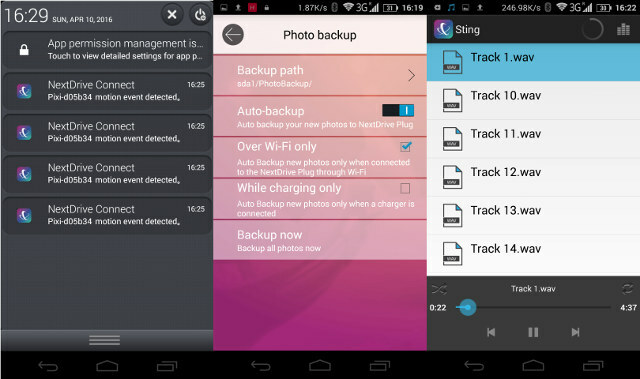 This works exactly like Dropbox photo backup, except it’s on your own private server. You can also navigate the drive where my NTFS and EXT-4 partitions recognized (but not exFAT), and start to play music on your phone with files stored in your NextDrive Plug. Since there’s a SAMBA server running on the plug, you can also access or add files from your computer using admin and the password used during setup. The admin can also give access to other users using a “direct link password” which works with smartphones only. My quick try of NextDrive Plug went rather well, with the exception that my webcam was not recognized. 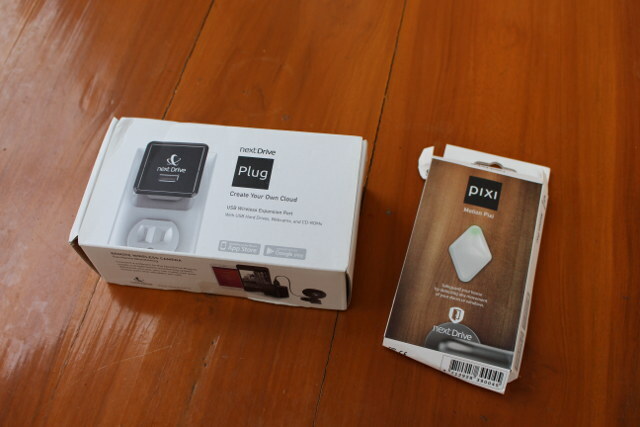 NextDrive Plug is sold on Amazon for $99, but I can’t find Pixi motion sensor for sale just yet. You can find the user’s manual, and other information on NextDrive.io website. Not to be confused with NextDrive (monthly subscription storage service), a division of IntermixIT, of Harrisburg PA.
Could there be legal issues with the name being the same? Same issue. It worked yesterday. Our web hosting service squarespace is currently down.